Deploying database changes in WordPress is hard, especially when working on teams with multiple developers. This project aims at solving this problem by storing database configuration in the filesystem. It's like Drupal's "Features" module for WordPress. Less need to copy the database. If you make changes, Push your bundle to the filesystem. To load changes, Pull the bundle into your database. No need to manually apply database settings changes. No more "fire drills" where you're rushing to figure out which settings you forgot to change. Track and migrate configuration files using git, subversion, etc. Bundle: A group of settings to track. This could be a single setting, or all the site's available settings. Push: Export configuration from your database to the filesystem. Pull: Import configuration from the filesystem into your database. The wpcfm_configuration_items hook lets you register custom configuration items. value: (required) The configuration data to store. group: (optional) A group name, allowing multiple configuration options to be grouped together. This is only used in the admin UI. Default = "WP Options"
callback: (optional) If the configuration data is not stored within wp_options, then WP-CFM needs to know how to Pull it into the database. This parameter accepts a (string) function name or (array) method. A $params array is passed into the callback function (see below). Almost! 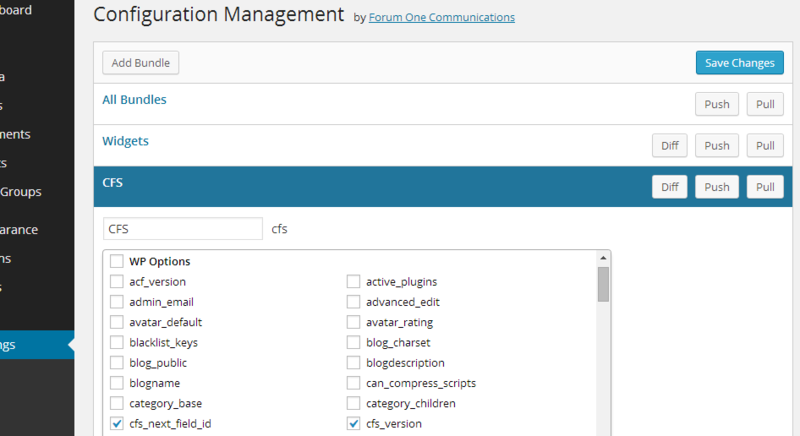 WP-CFM automatically handles configuration within the wp_options table. If your plugin stores settings elsewhere, then use the above callback parameter to tell WP-CFM how to properly import (Pull) configuration into the database. You can optionally set bundle_name to "all" to push / pull all bundles at once.